On Second Scoop: Ice Cream Reviews: Summer Question: Lemon or Peach? Summer Question: Lemon or Peach? 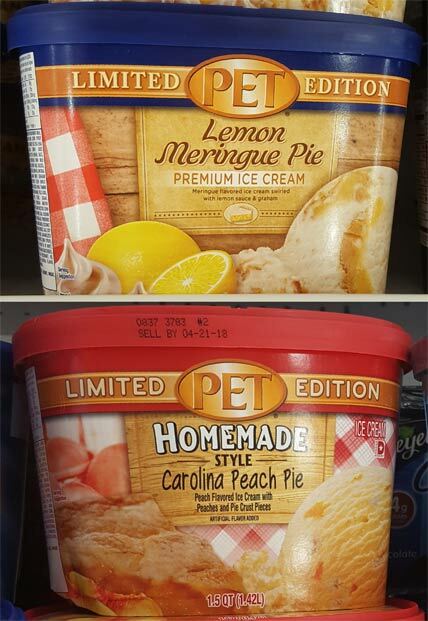 We have two PET Limited Edition Ice Creams here, Lemon Meringue Pie Premium Ice Cream and Homemade Style Carolina Peach Pie ice cream. Has anyone tried either? Or have you tried PET at all? In general, what's your favorite summer flavor? I think I would grab the peach first but I'm not positive. P.S. Anyone know what "homemade style" is? P.S.S. PET Dairy website says that they've been around for 85 years, they are available in Virginia, Georgia, and the Carolines, and they are owned by Dean Foods. I haven't had either of these, but the best PET flavor is their version of Birthday Cake by far! It has the BEST frosting swirls! Outside of that, I can say that, as a born-and-bred south central Virginia native, that their Nutty Buddies are a mainstay in school cafeterias everywhere around here. I couldn't even tell you how many of those delicious things I bought as a kid. Team lemon, all the way (specifically, the Lemon Custard ice cream flavor from Leopold's in Savannah, GA. I had it shipped). I like lemon and peach, but my summer flavor is anything berries and cream. I've been really enjoying Häagen-Dazs' vanilla blackberry trio and talenti's vanilla blueberry! I have been a Virginian for all of my life. PET is a staple ice cream. PET also sells chocolate milk and plain milk. They have a basic and premium line so they are not a "cheap" line necessarily. I've had both the lemon and peach, and I like both. It depends on my mood. Their novelties have been in schools forever. I also had them at school and have fond memories! I haven't tried (or even seen) this brand around Maryland, but I've always been team lemon! I love a fresh peach, but there's something about peach flavored products (including ice cream) that I'm just not crazy about. Food Lion in Maryland sells this if you want to try.